The RRRA has been offered a Partnership Agreement with NRCS through the Regional Conservation Partnership Program (RCPP) to provide funding for the implementation of PL556 watershed protection ﻿projects﻿ in the Basin. ($12 million) The RCPP is also a part of the 2014 Farm Bill. 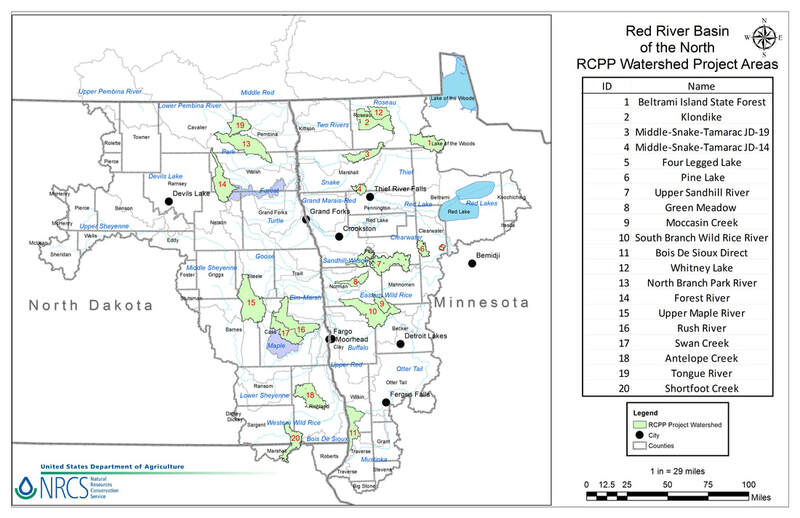 A map of the RCPP watershed project areas in the Red River Basin of the North can be viewed here. On June 13, 2017, Co-chairman John Finney provided Congressional testimony to the Subcommittee on Conservation and Forestry and responded to questions from the members of the Committee regarding Small Watershed Infrastructure: "Continuing the Mission, Building Upon Success." His testimony can be heard at https://youtu.be/INCrFRchsB8?t=4710 and begins at 1 hour 18 minutes and 30 seconds.